Below are beaded horse halters for sale on eBay and Etsy. The beaded halters on eBay are usually already completed and ready to ship. The ones on Etsy might be ready to ship, but are often custom, made-to-order halters (usually with your choice of colors, brands, lettering, etc.) and will not be crafted until you place your order. Please scroll down for good things to know before buying a beaded horse halter on Etsy. You might also like: Beaded Horse Headstalls. Below: A tray of beads ready for making horse halters (or other items). This area lets you compare price and selection from two major online sellers, eBay and Etsy, all on one page! 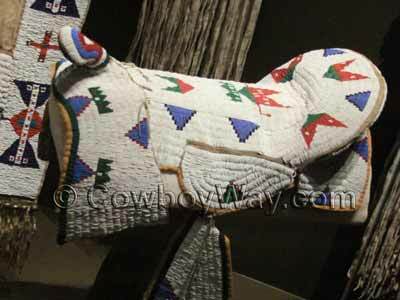 Below: A Native American, spectacular, beaded saddle cover. People have loved to decorate their horse tack, including halters, with beads centuries. Photo from the National Cowboy and Western Heritage Museum in Oklahoma City, OK.
Do you supply the halter, or does the seller? Most of the beaded horse halters we've seen on eBay are already made and ready to ship, so, in a case like this, the seller obviously supplies the halter. However, if you're having a custom halter made on Etsy (or sometimes eBay, too)you should make sure you know who supplies the halter. Most of the Etsy sellers we have seen supply it, but not all of them. Read the description to find out for sure. What will the shipping charges be? Will they be extra, or are they included in the price? Are returns accepted, or refunds given? On customized items, many sellers do NOT offer returns or refunds. However, each seller is different and sets their own policies. If you don't see the information be sure to ask the seller what their policies are before placing an order. Speaking of feedback...... While there all types of sellers on Etsy, including businesses that do a large volume of selling, many of the sellers on Etsy are individual craftsmen or small businesses specializing in handcrafted items. This means these sellers don't deal in high volume - by their own choice - and therefore only have a small amount of feedback. Just make sure the feedback they have is positive. Last but not least, if you have any questions about a beaded horse halter be sure to ask the seller before you buy! On both eBay and Etsy you should be able to find a link to send the seller your message or question.